← Dog Raised With a Bunny. . . . . Can You Tell? Yes, You Can Go Home. . . . . .
India is the largest producer of films in the world and the largest audience with 1.2 billion people who love film. It is an escape from the pressures of life. Yes, almost every Indian film has dancing and is a comic romance. Even a western we saw in India had a huge dance number. It was in the middle of a gun fight, everyone put down his gun, danced with the beautiful girls, and afterwards picked up the guns and continued shooting. The only film I remember without a dance was” 26/11″ which was about the sneak attacks in Mumbai on that date which was very somber. Two more details about Indian cinema is that there is an intermission about half way through. The film just stops, lights blaze, people jump up and head for the doors. The line at the bathroom is every so long as is the popcorn, candy counter. This is to keep the patrons comfortable and the vendors selling snacks. Works well, but is quite startling at first. One final thought is the release of films in the United States and India. Did you know that Hollywood releases the block busters in India a few days before the premier in the US. Why you might ask? B$2 which seems cheap to us but is pricey for the Indian poor! We discovered this in 2013 with the release of “American Sniper” . Half the group loved the film and when talking to family back in the US had not seen it yet as it had not been yet released Interesting? Imagine you’re 5 years old and 1,000 miles away from home — not knowing your last name or your address. How do you find your way back? Bill Whitaker reports on one man’s powerful story of loss and love. The following is a script from “Lost,” which aired on Dec. 11, 2016. Bill Whitaker is the correspondent. Marc Lieberman, producer. Saroo Brierley is a 35 year-old-man with a powerful story of loss and love. As a 5-year-old child in India, he became impossibly lost in Calcutta, a sprawling, chaotic city of 14 million people. He said he had no money, no one to help him, no clue how to get back home. That he survived is amazing enough. What happened next got Hollywood’s attention. His story is now a movie, called “Lion,” the English translation of his Indian name. 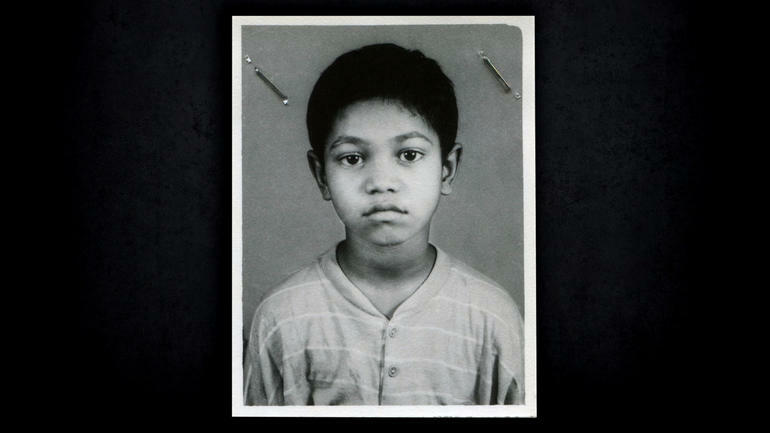 But there would be no movie, no story without Saroo’s memories, the recollections of a terrified little boy. It’s hard to recall events from age 5, but witnesses we talked to and documents we found support almost all that he remembers. Saroo Brierley considers himself lucky to be alive. When you hear his story, we think you’ll understand why. 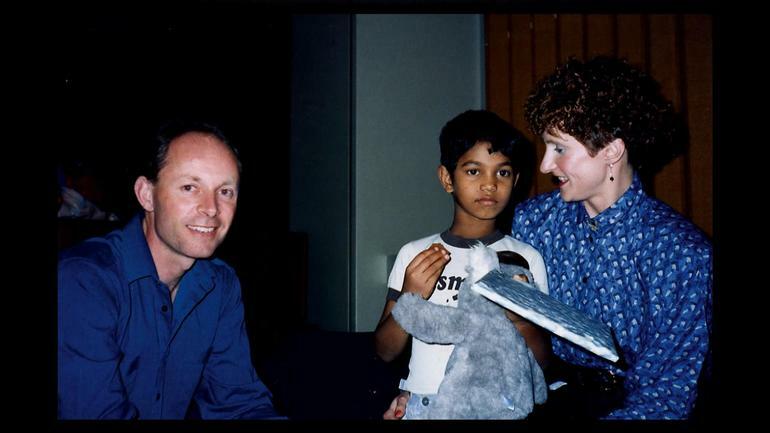 Saroo Brierley: I remember it so vividly. It’s– it’s a memory that’s been within me for such a long time. Saroo Brierley: We’re always hungry. We were always sort of having to sort of live a day at a time. Saroo Brierley: If I really wanted to sort of find food, the train station is the best place. It wasn’t just myself, there was other beggars and people at the train station too. Saroo Brierley: Yeah. I’d see whilst I’m sort of sleeping or almost asleep next to my sister and I could see sort of tears going down her eyes as well. Saroo Brierley: And I just wanted to go to sleep. And my brother said, “Wait here. I’ll be back.” I ended up going to sleep on the bench. I’m not too sure whether it was like 10 minutes, 20 minutes, an hour, two hours, three hours. When he woke up, he remembers a train was there but his brother was not. Saroo thought he might be inside looking under seats for coins and food. He didn’t find him but he did find a comfortable seat and fell back to sleep. When he woke up again, as depicted in the movie, the train was careening across India for hours and hours. Saroo Brierley: It’s hurtling down the tracks. And I just ran up and down. Tears. I was locked in the carriage. I couldn’t open it. I’m on this carriage, on this train, all by myself locked as a prisoner. Its prisoner. Bill Whitaker: And you’re five years old. Saroo Brierley: And I’m five years old. Saroo Brierley: I was panicking. My heart was going triple time. I’m calling out for my brother, my sister and my mother. Bill Whitaker: Was no one paying attention to a little– little kid in the crowd? Saroo Brierley: No one was paying attention. No. To them it’s like you’re just another kid outside the train station. You know? A beggar out from the train station. To make matters worse: He spoke Hindi. In Calcutta, people speak Bengali. He avoided the police because, at home, police arrested beggars. So he’d have to do what he’d learned from his brothers. Survive on his wits and scavenge in a vast, unforgiving city threatening to swallow him up. He slept alongside other street kids in the train station but there were adult predators at night. Five-year-old Saroo didn’t know his last name, didn’t know his address, didn’t know the name of his village. They put his picture on flyers, on TV, in the paper. But no one responded. He was declared a lost child of India. The woman who ran the orphanage told Saroo a family in Australia wanted to adopt him. About six months after getting on that train, he got on a jumbo jet to Australia where he met his new mom and dad, Sue and John Brierley. Sue Brierley: It was just so amazing. He just had these incredible eyes. And calmness about him. He seemed a little bit cautious. But he didn’t seem fearful. They took Saroo back to their home on the Australian island of Tasmania where he had a toy filled room as big as his house in India. His new mother put a map of India on his wall so he’d always remember where he came from. Saroo Brierley: They did. But they didn’t know my past and what had been. And I only told ‘em to the point of you know as much language as I had that I could describe things. Saroo Brierley: I was happy, I was comfortable, getting the love that I—that I’ve always sort of wanted. Saroo Brierley: Helpless. That’s what it was, at the end of the day. You couldn’t do anything. You think about it quite a bit. I was holding onto those memories, never to let go. Saroo Brierley: It’s just so massive. And this is what I’ve been sort of looking at. With Google Earth, he could get a bird’s eye view of towns and landmarks. He calculated a search radius from Calcutta based on the speed of trains and the time he thought he was locked on board. Night after night, he would follow the tracks looking for anything that would match his memory of the station where he got lost. Bill Whitaker: So out of all of India, all the train stations in all of India, you’re looking for a water tower and a walkway over the train tracks? Farther on, he saw the dam where he played in the river. It all matched what he’d told his adoptive mother Sue years earlier, down to the map they had drawn in the diary. Bill Whitaker: Many people don’t remember younger than five, but yet you remember in such great detail. Why do you think that is? Saroo Brierley: I reckon what it is, is that I never went to school. So language wasn’t really in me, you know. It was all visual. My visual senses were extremely heightened. He knew he had to go to India to try to find his mother. At the airport, Sue gave him this photo. It’s how he would have looked when his birth mother last saw him. After 25 years, 16 hours on the plane, and a four-hour drive, he was finally home. It was just as he’d remembered – the path he’d walked many times to his house. But when he got there, it was abandoned. Bill Whitaker: Your family’s not there. What are you thinking? Saroo Brierley: I thought “They’re dead.” I thought the worst. All the worst things that you could think of possibly was just going through my head. Saroo, now an Aussie, stood out in the slum. He couldn’t communicate. A man approached who spoke English. Saroo said he was looking for the family that had lived in this house. The man told Saroo to come with him. Saroo Brierley: And I walked for about 15 meters just around the corner, and the man goes, “This is your mother.” And she walked forward, and I walked towards her. We– we’re– our eyes were locked together. Bill Whitaker: What’d you see in your birth mother’s eyes when you look in them for the first time in years? Saroo Brierley: The tears that I saw when I used to look at her and I can see that she’s struggling but this time it was tears of joy. We sent our cameras to his home village. 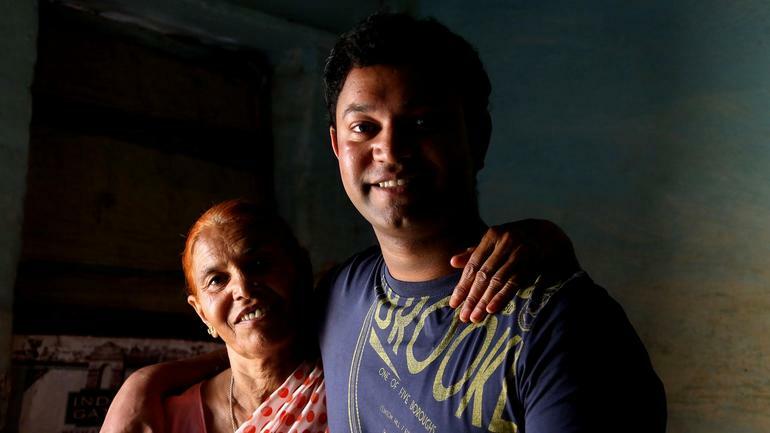 His mother Kamla told us “When I saw him I knew he was my Saroo.” He’s now been back to India 14 times. He reunited with his sister and one brother who both had moved to a nearby city. But his mother never left their village. Saroo Brierley: Yes and I can’t think you know what she went through. It’s like one is just you know here it is he’s died but the other one he’s just disappeared. Saroo Brierley: Because she felt that one day the son that she had lost would come back. And it was amazing because here I am, determined to find my hometown and my family from one side of the world, oceans apart, and here’s my birth mother sitting there and waiting because she knew that one day her son would come back. And I’m so glad that she did. This entry was posted in film, India, Travel, Uncategorized, USA and tagged "The Lion", Dev Patel, Hollywood, Indian film. Bookmark the permalink.